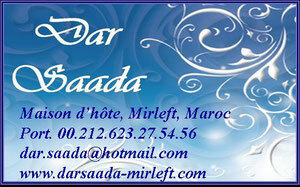 Dar Saada Mirleft is a traditional guest house enjoying a PANORAMIC view SPECIAL from the 2 beautiful terraces, on which travelers take their breakfast front of the most enchanting panorama: the ocean, the beach and the valley. The sandy beach is just down Dar Saada and access only 50m away. This house is managed by a couple of Swiss-French / Moroccan. We are discreetly present for serving breakfasts and to meet your needs. 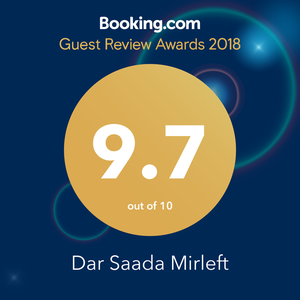 The peculiarity of Dar Saada is EXCLUSIVE to the guest house, personally dedicated to each of our clients.So you can share special moments with your friends, your family with young children, Couple or Solitaire. In addition to your / your guest rooms, you have the entire guest house for your exclusive use (except the kitchen reserved to the personnel department Dar Saada). A table tennis is installed in the playroom for children but also for adults.